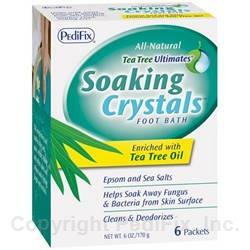 A therapeutic foot soak featuring our exclusive blend of Tea Tree and Peppermint essential oils, Epsom and Sea Salts. This invigorating soak soothes aches and pains, relieves itching and softens corns and calluses while fighting fungus and bacteria. Leaves feet feeling refreshed, clean and smelling great! Each box contains (6) 1 oz. packets. Soothing Full Body Soak, Too! Fill basin or tub with warm water. For foot soaks, add 1/2 packet. For a full bath, add entire contents of packet to still water. Stir by hand to activate essential oils. Carefully immerse yourself or your feet and soak for about 15 minutes.